JOIN US FOR CLASSES IN BROOKLINE! GroovyBabyMusic offers, Radiant Child Yoga, the premier program to introduce yoga to kids. Class includes a rich of assortment of child-friendly postures, breathing exercises, meditation and relaxation techniques, games and songs to help children learn to practice yoga. Children have tons of fun exploring their new moves while building strong body and breath awareness, self-calming and cooperative skills, and confidence. These are precious years during which to instill the deeply life-enriching benefits of a yoga practice in our young yogis' lives! It’s never too early to start practicing yoga! When are Classes this Spring? Little yogis learn yoga breathing, postures and meditation in each hour class. Imagination is key with this age group! Activities like “blowing out birthday candles” help us tune in and help little yogis learn yoga breathing. We go on yoga adventures! “Traveling” to faraway lands, little yogis are guided through poses that represent all that they encounter. A tree, a mountain, a lion in the jungle! Music is incorporated into each class to help students remain engaged and relaxed and to reinforce the positive messages of the yoga practice through thoughtful and kid-friendly lyrics. Deep relaxation is always followed by a simple meditation. Each class ends with a mindful game, activity or simple art project. Little yogis will leave class with a weekly “homework” assignment to continue their practice at home (for example a coloring page with a new yoga pose, instructions to practice the meditation learned in class, etc.) Parents may participate or observe this class. Big Yogis (ages 6-9 Years) will continue to explore the joys of yoga as they practice more physically challenging postures to build strength, balance and focus in their one-hour class. Yoga breathing, postures and meditation will be included in all classes. Big yogis focus on building strong body and breath awareness, cooperative skills, and self-confidence. Children will help teach the yoga adventures, calling upon creativity and imagination whilst building leadership skills. Activities like partner yoga enforce cooperative learning and are great fun! Deep relaxation is always followed by meditation or a simple chant. Each class ends with a mindful game, activity or simple art project. 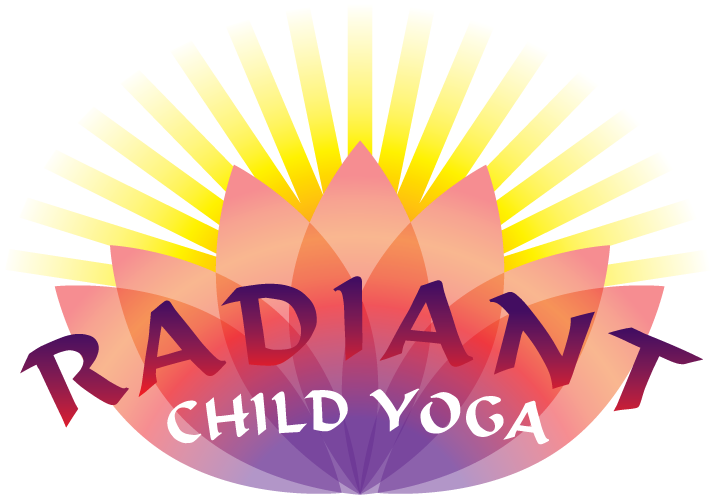 What Should I Expect in a Radiant Child Yoga Class? Developmentally appropriate teaching of yoga poses and breathing exercises...where yoga is fun! Scholarship Info & Why Classes for ALL! Here at GroovyBabyMusic, we are committed to bringing music and movement education to everyone in our community. We want all families to have the opportunity to experience the joy of our classes, so we allow everyone to join us, regardless of ability to pay! Please feel free to Contact Us to receive financial assistance for our classes and we will email you our scholarship application form. We will always do our best to accommodate you!